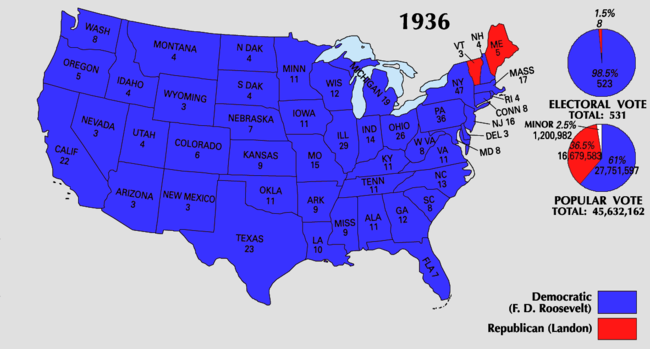 For related races, see 1936 United States elections. Presidential election results map. Blue denotes those won by Roosevelt/Garner, red denotes states won by Landon/Knox. Numbers indicate the number of electoral votes allotted to each state. The United States presidential election of 1936 was the thirty-eighth quadrennial presidential election, held on Tuesday, November 3, 1936. 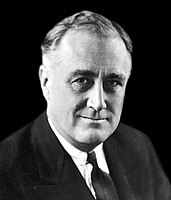 In the midst of the Great Depression, incumbent Democratic President Franklin D. Roosevelt defeated Republican Governor Alf Landon of Kansas. Roosevelt won the highest share of the popular and electoral vote since the largely uncontested 1820 election. The sweeping victory consolidated the New Deal Coalition in control of the Fifth Party System. Roosevelt and Vice President John Nance Garner were re-nominated without opposition. 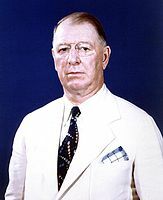 With the backing of party leaders, Landon defeated progressive Senator William Borah at the 1936 Republican National Convention to win his party's presidential nomination. The populist Union Party nominated Congressman William Lemke for president. The election took place as the Great Depression entered its eighth year. Roosevelt was still working to push the provisions of his New Deal economic policy through Congress and the courts. However, the New Deal policies he had already enacted, such as Social Security and unemployment benefits, had proven to be highly popular with most Americans. Landon, a political moderate, accepted much of the New Deal but criticized it for waste and inefficiency. Although some political pundits predicted a close race, Roosevelt went on to win the greatest electoral landslide since the beginning of the current two-party system in the 1850s. Roosevelt took 60.8% of the popular vote, while Landon won 36.5% and Lemke won just under 2%. Roosevelt carried every state except Maine and Vermont, which together cast eight electoral votes. By winning 523 electoral votes, Roosevelt received 98.49% of the electoral vote total, which remains the highest percentage of the electoral vote won by any candidate since 1820. Roosevelt also won the highest share of the popular vote since 1820, though Lyndon B. Johnson would later win a slightly higher share of the popular vote in the 1964 election. Before his assassination, there was a challenge from Louisiana Senator Huey Long. But, due to his untimely death, President Roosevelt faced only one primary opponent other than various favorite sons. Henry Skillman Breckinridge, an anti-New Deal lawyer from New York, filed to run against Roosevelt in four primaries. Breckinridge's challenge of the popularity of the New Deal among Democrats failed miserably. In New Jersey, President Roosevelt did not file for the preference vote and lost that primary to Breckinridge, even though he did receive 19% of the vote on write-ins. Roosevelt's candidates for delegates swept the race in New Jersey and elsewhere. In other primaries, Breckinridge's best showing was 15% in Maryland. Overall, Roosevelt received 93% of the primary vote, compared to 2% for Breckinridge. The Democratic Party Convention was held in Philadelphia between July 23 and 27. The delegates unanimously re-nominated incumbents President Roosevelt and Vice-President John Nance Garner. At Roosevelt's request, the two-thirds rule, which had given the South a de facto veto power, was repealed. The 1936 Republican National Convention was held in Cleveland, Ohio, between June 9 and 12. Although many candidates sought the Republican nomination, only two, Governor Landon and Senator William Borah from Idaho, were considered to be serious candidates. 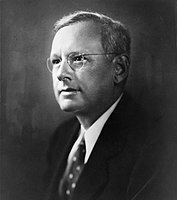 While favorite sons County Attorney Earl Warren from California, Governor Warren Green of South Dakota, and Stephen A. Day from Ohio won their respective primaries, the seventy-year-old Borah, a well-known progressive and "insurgent," won the Wisconsin, Nebraska, Pennsylvania, West Virginia, and Oregon primaries, while also performing quite strongly in Knox's Illinois and Green's South Dakota. The party machinery, however, almost uniformly backed Landon, a wealthy businessman and centrist, who won primaries in Massachusetts and New Jersey and dominated in the caucuses and at state party conventions. Many people, most significantly Democratic National Committee Chairman James Farley, expected Huey Long, the colorful Democratic senator from Louisiana, to run as a third-party candidate with his "Share Our Wealth" program as his platform. Polls made during 1934 and 1935 suggested Long could have won between six and seven million votes, or approximately fifteen percent of the actual number cast in the 1936 election. However, Long was assassinated in September 1935. Some historians, including Long biographer T. Harry Williams, contend that Long had never, in fact, intended to run for the presidency in 1936. Instead, he had been plotting with Father Charles Coughlin, a Catholic priest and populist talk radio personality, to run someone else on the soon-to-be-formed "Share Our Wealth" Party ticket. According to Williams, the idea was that this candidate would split the left-wing vote with President Roosevelt, thereby electing a Republican president and proving the electoral appeal of Share Our Wealth. Long would then wait four years and run for president as a Democrat in 1940. 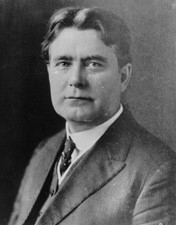 Prior to Long's death, leading contenders for the role of the sacrificial 1936 candidate included Idaho Senator William Borah, Montana Senator and running mate of Robert La Follette in 1924 Burton K. Wheeler, and Governor Floyd B. Olson of the Minnesota Farmer–Labor Party. After Long's assassination, however, the two senators lost interest in the idea, while Olson was diagnosed with terminal stomach cancer. Father Coughlin, who had allied himself with Dr. Francis Townsend, a left-wing political activist who was pushing for the creation of an old-age pension system, and Rev. Gerald L. K. Smith, was eventually forced to run Representative William Lemke (R-North Dakota) as the candidate of the newly created "Union Party". Lemke, who lacked the charisma and national stature of the other potential candidates, fared poorly in the election, barely managing two percent of the vote, and the party was dissolved the following year. William Dudley Pelley, Chief of the Silver Shirts Legion, ran on the ballot for the Christian Party in Washington State, but won fewer than two thousand votes. Earl Browder ran for the Communist Party (CPUSA). This election is notable for The Literary Digest poll, which was based on ten million questionnaires mailed to readers and potential readers; 2.3 million were returned. The Literary Digest, which had correctly predicted the winner of the last 5 elections, announced in its October 31 issue that Landon would be the winner with 370 electoral votes. The cause of this mistake has often been attributed to improper sampling: more Republicans subscribed to the Literary Digest than Democrats, and were thus more likely to vote for Landon than Roosevelt, and indeed every other poll made at this time predicted Roosevelt would win, although most expected him to garner no more than 360 electoral votes. However, a 1976 article in The American Statistician demonstrates that the actual reason for the error was that the Literary Digest relied on voluntary responses. As the article explains, the 2.3 million "respondents who returned their questionnaires represented only that subset of the population with a relatively intense interest in the subject at hand, and as such constitute in no sense a random sample ... it seems clear that the minority of anti-Roosevelt voters felt more strongly about the election than did the pro-Roosevelt majority." A more detailed study in 1988 showed that both the initial sample and non-response bias were contributing factors, and that the error due to the initial sample taken alone would not have been sufficient to predict the Landon victory. This mistake by the Literary Digest proved to be devastating to the magazine's credibility and it ceased publishing within a few months of the election. That same year, George Gallup, an advertising executive who had begun a scientific poll, predicted that Roosevelt would win the election, based on a quota sample of 50,000 people. He also predicted that the Literary Digest would mis-predict the results. His correct predictions made public opinion polling a critical element of elections for journalists and indeed for politicians. The Gallup Poll would become a staple of future presidential elections, and remains one of the most prominent election polling organizations. Landon proved to be an ineffective campaigner who rarely traveled. Most of the attacks on FDR and Social Security were developed by Republican campaigners rather than Landon himself. In the two months after his nomination he made no campaign appearances. Columnist Westbrook Pegler lampooned, "Considerable mystery surrounds the disappearance of Alfred M. Landon of Topeka, Kansas ... The Missing Persons Bureau has sent out an alarm bulletin bearing Mr. Landon's photograph and other particulars, and anyone having information of his whereabouts is asked to communicate direct with the Republican National Committee." The President spoke truly when he boasted ... "We have built up new instruments of public power." He spoke truly when he said these instruments could provide "shackles for the liberties of the people ... and ... enslavement for the public". These powers were granted with the understanding that they were only temporary. But after the powers had been obtained, and after the emergency was clearly over, we were told that another emergency would be created if the power was given up. In other words, the concentration of power in the hands of the President was not a question of temporary emergency. It was a question of permanent national policy. In my opinion the emergency of 1933 was a mere excuse ... National economic planning—the term used by this Administration to describe its policy—violates the basic ideals of the American system ... The price of economic planning is the loss of economic freedom. And economic freedom and personal liberty go hand in hand. Roosevelt won in a landslide, carrying 46 of the 48 states and bringing in many additional Democratic members of Congress. After Lyndon B. Johnson's 61.1 percent share of the popular vote in 1964, Roosevelt's 60.8 percent is the second-largest percentage in U.S. history since the nearly unopposed election of James Monroe in 1820, and his 98.5% of the electoral vote is the highest in two-party competition. 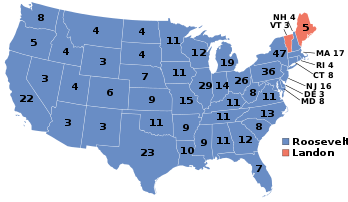 Roosevelt won the largest number of electoral votes ever recorded at that time, so far only surpassed by Ronald Reagan in 1984, when seven more electoral votes were available to contest. Garner won the highest percentage of the electoral vote of any vice president. 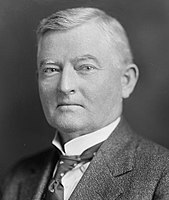 Landon became the second official major-party candidate since the current system was established to win fewer than ten electoral votes by tying William Howard Taft, who won eight votes in his unsuccessful re-election campaign in 1912. No major-party candidate has won so few electoral votes since this election. The closest anyone has come was Reagan's 1984 opponent Walter Mondale, who won only thirteen electoral votes. This was the last Democratic landslide in the west. Democrats won every state except Kansas (Landon's home state) by more than 10%. West of the Great Plains States, Democrats only lost seven counties. Since 1936, only Richard Nixon in 1972 has even approached such a disproportionate ratio, winning all but 13 counties. After 1936, the west rapidly became a Republican stronghold, the only region that has been consistent in the party it supports for such a long time. Of the 3,095 counties, parishes and independent cities making returns, Roosevelt won in 2,634 (85 percent) while Landon carried 461 (15 percent). Democrats also expanded their majorities in Congress, winning control of over three-quarters of the seats in each house. The election saw the consolidation of the New Deal coalition; while the Democrats lost some of their traditional allies in big business, they were replaced by groups such as organized labor and African Americans, the latter of whom voted Democratic for the first time since the Civil War. Roosevelt lost high income voters, especially businessmen and professionals, but made major gains among the poor and minorities. He won 86 percent of the Jewish vote, 81 percent of the Catholics, 80 percent of union members, 76 percent of Southerners, 76 percent of Blacks in northern cities, and 75 percent of people on relief. Roosevelt carried 102 of the nation's 106 cities with a population of 100,000 or more. Some political pundits predicted the Republicans, whom many voters blamed for the Great Depression, would soon become an extinct political party. However, the Republicans would make a strong comeback in the 1938 congressional elections and would remain a potent force in Congress, although they were not able to win the presidency again until 1952. The Electoral College results, in which Landon only won Maine and Vermont, inspired Democratic Party chairman James Farley, who had in fact declared during the campaign that Roosevelt was to lose only these two states, to amend the then-conventional political wisdom of "As Maine goes, so goes the nation" into "As Maine goes, so goes Vermont." Additionally, a prankster posted a sign on Vermont's border with New Hampshire the day after the 1936 election, reading, "You are now leaving the United States." Some of Roosevelt's advisers even joked that America's fiscal woes might be best solved if he offered to sell Vermont and Maine to Canada. As of 2019, even after a quarter century as a classic "blue" state that usually supports Democratic presidential candidates, Vermont has voted for more Republican presidential nominees than any other state. From 1856 through 1960, Vermont gave the state's electoral votes to the Republican Party nominee in every presidential election. No other state has voted so many consecutive times for candidates of the same political party. Maine once held a similar political record, voting from 1856 through 1960 for the Republican candidate in every presidential election but one, when in 1912, the state gave Democrat Woodrow Wilson a plurality with 39.43% of the vote. Another state that had been reliably Republican for a very long time before 1936 was Pennsylvania, which Roosevelt was the first Democrat to carry since "favorite son" James Buchanan won Pennsylvania in 1856. Source (Popular Vote): Leip, David. "1936 Presidential Election Results". Dave Leip's Atlas of U.S. Presidential Elections. Retrieved July 31, 2005. Source (Electoral Vote): "Electoral College Box Scores 1789–1996". National Archives and Records Administration. Retrieved July 31, 2005. This was the last election until 1964 in which the Democrats won Indiana, Kansas, Nebraska, North Dakota, and South Dakota. Roosevelt's landslide remains the penultimate occasion Democrats won those last four very solid Republican Plains States, and the last time Democrats won them in two consecutive elections. Indiana has subsequently been won by the Democrats only in 1964 and 2008. This was the last election that Indiana voted democratic twice in a row, and the only time since the creation of the Republican party that Indiana voted democratic twice. South Dakota is the only other state to have a similar record. This was the last election in which the Democrats won Colorado and Iowa until 1948. As of 1936, this was the closest a Democrat had ever come to winning Vermont (to be topped in 1940, and then again in 1964 & 1968, 1976, and every election from 1988 to present). 1936 was the last time until 2016 the Democrats won Orange County, California. This election remains the last presidential election when a Democratic candidate ever carried Tulsa County, Oklahoma, Douglas County, Nevada, Josephine County, Oregon, Ada County, Idaho, Sioux County, Iowa, Hughes County, South Dakota, Lebanon County, Pennsylvania and over thirty smaller counties in Nebraska and Kansas. This was the best score ever received by any Democrat in the four following states: Wisconsin (63.8%), Oregon (64.42%), Washington (66.38%), and Wyoming (60.58%), and the outright best score ever received by any candidate in three states: South Carolina, (98.57%), California (66.95%), and Arizona (69.85%). This was the last time Democrats crossed the 70% line in Virginia and Nevada, and the 60% line in Idaho, Montana, Wyoming, Utah, Arizona, and New Mexico. ^ "Voter Turnout in Presidential Elections". The American Presidency Project. UC Santa Barbara. ^ Paul Kleppner et al. The Evolution of American Electoral Systems pp 219–225. ^ "Squire, Peverill "Why the 1936 Literary Digest Poll Failed" Public Opinion Quarterly, 52:125–133 1988". Archived from the original on January 6, 2014. Retrieved September 17, 2017. ^ "r/MapPorn - 1972 United States presidential election results by county [1513 x 983]". reddit. Retrieved October 28, 2018. ^ Smith 2007, pp. 373–375. ^ Mary E. Stuckey (2015). Voting Deliberatively: FDR and the 1936 Presidential Campaign. Penn State UP. p. 19. ^ "1936 Presidential General Election Data - National". Retrieved April 8, 2013. Communist Party USA, The Communist Election Platform, 1936. New York: Workers Library Publishers, 1936. This page was last edited on 13 April 2019, at 19:01 (UTC).